Sperm whales are totally unique. Colossal giants of the deep, their presence commands a reverent awe. They possess the largest brain in the animal kingdom and spend much of their lives in the light-starved depths of the oceans hunting prey. 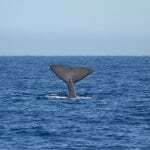 What do sperm whales look like? The mighty sperm whales look nothing like any other whale. For a start, they each have an enormous square-shaped head which accounts for around a third of their body length. They have stumpy dorsal fins and two relatively small pectoral fins on either side of their wrinkle-covered bodies. Even a sperm whale’s blow hole is different: just a single exhalation which rises to the left. Perhaps their most recognizable trait though is their jaw, containing up to 52 cone-shaped teeth in the lower half, weighing a kilo each! What’s life like for a sperm whale? Take a deep breath. Spending much of their lives hunting in the deep for their prey, sperm whales can dive to depths of up to 3km and hold their breath for an incredible 2 hours. Immense diving prowess aside, the social structures of sperm whales are not totally unlike that of humans. Young male sperm whales often hang out in groups, until they are around 30 years when they tend to go their separate ways. Females on the other hand like to spend more time together and join in ‘nursery schools’ to look after young, protecting their babies from predatory sharks or orcas who might be feeling brave enough to take them on. 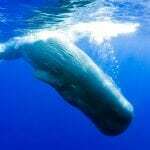 Sourcing their food from the ocean depths, sperm whales use a highly advanced echolocation system that enables them to navigate in this murky, cold world. 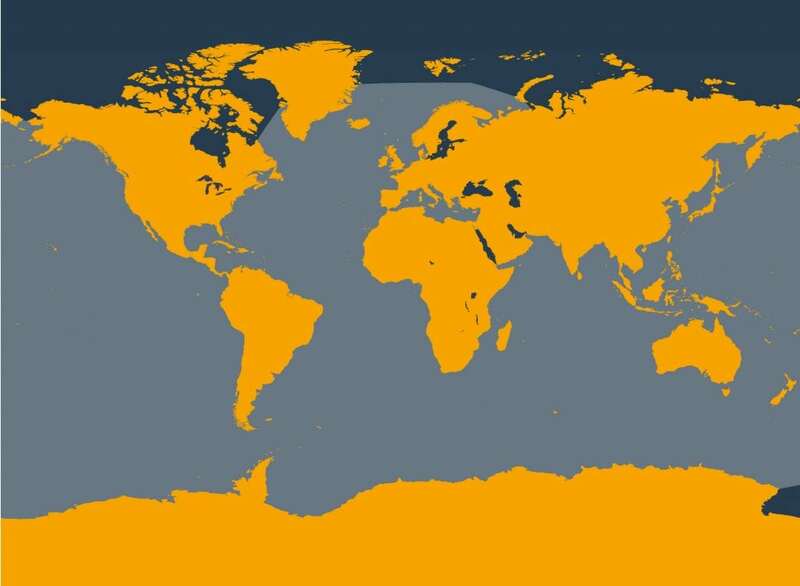 A firm favourite amongst sperm whales, giant squid top the menu. Unlike many creatures featured in literature and folklore, giant squid really do exist, but even at over 10 meters in length, they are no match for a sperm whale. That said, they put up a good fight, and many whales carry the scars of their underwater encounters. More manageable smaller squid, octopus, fish and crustaceans are also appetizing treats, as well as some deep-dwelling sharks. 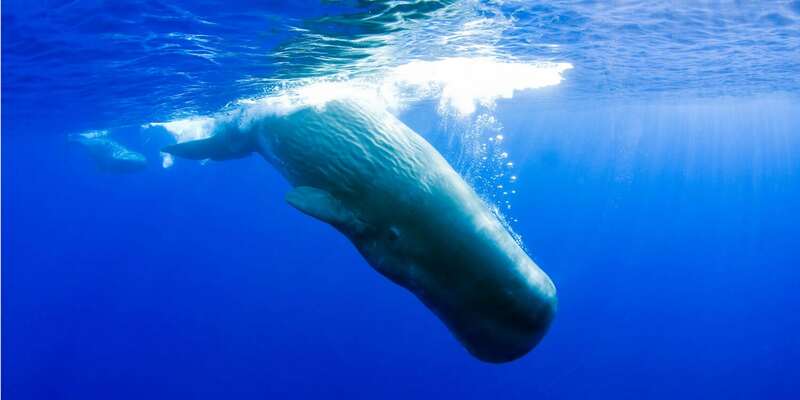 Sperm whales are found throughout the world’s oceans, preferring deep water. 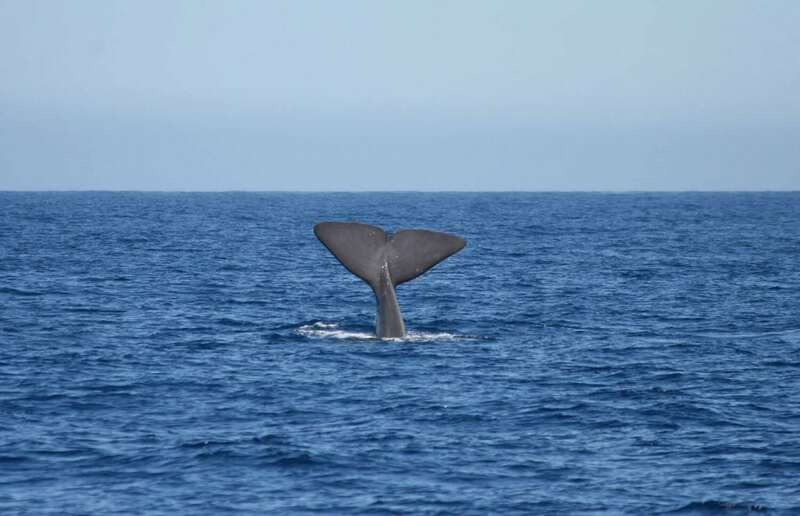 As a result they are seldom found close to land though Kaikoura off New Zealand’s South Island is one exception. 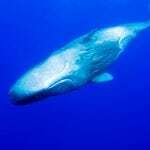 Island chains such as the Azores and Galapagos are also home to sperm whales, though overall numbers are just a fragment of an original population decimated by centuries of whaling. A sperm whale will dive 2-3km in search of prey and hold its breath for up to two hours, although 45 minutes is the average dive time. Light only penetrates a limited distance underwater so it uses echolocation to find its way around and hunt for squid. Sperm whales make the loudest sounds of any animal. They can emit a click at around 230 decibels, considerably louder than a jet engine at around 150db. 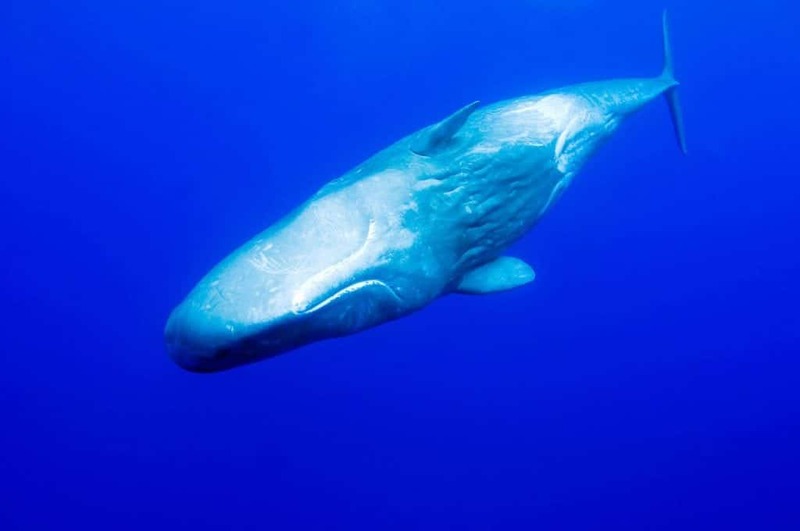 However, a sperm whale click only lasts 100 microseconds (a microsecond is 1 millionth of a second), whereas a blue whale’s call at 188db lasts 20-30 seconds. In recent years, scientists have begun to make some amazing discoveries about sperm whale society. Sperm whales have cultural groups, made up of ‘clans’ of different whales, which use patterns of clicks (called codas) that are unique to that group. Think of it as going to a sporting event with fellow supporters of your team. Outside of that event you might not see your fellow supporters, or even have much in common with them, but once at the event you all know the words to the team’s chants, sharing a sort of culture. Although sperm whales don’t have favourite sports teams (as far as we know), they still share certain practices, which include sharing knowledge about the best places to find food. Whaling targeted all the large whales, but the most prized of all was the sperm whale. A space inside a sperm whale’s head can contain up to 1900kg of a yellow waxy substance, known as spermaceti oil. Scientists believe it may help with buoyancy or echolocation. Originally it was used in everything from cosmetics to candles, and later on in car engines and other industrial activities too. Today, Jojoba oil can be used as an alternative. Sperm whales numbers were decimated by whaling. Today, as they slowly recover, they face other threats from human activities. Pollution – toxic chemicals from plastics, litter and oil spills build up in sperm whales, seriously harming their health and their ability to have young. Fishing gear – sperm whales get accidentally caught in fishing nets and lines, injuring or even killing them. Noise pollution – sperm whales live in a world of sound and increased noise in the oceans from human activities impacts their lives. By adopting a dolphin or by making a donation, you can help us protect these amazing creatures. Adopt a dolphin and follow the lives of these amazing creatures. Your gifts help us take action to protect their homes.